My book “Trailing Sky Six Feathers” in 15 seconds on YouTube. Please share. Thank you. Spiritual awakening is needed to ensure survival, author says. Ian Prattis shares personal journey, advocates about spiritual awakening, empowerment in new book: Trailing Sky Six Feathers: One Man’s Journey with His Muse. Prattis further believes that global culture needs to awaken spiritually if humanity wants to ensure survival. For him, “the world has become an unpredictable beast that people fail to work with intelligently; and humanity has to take back control of themselves, for this is a spiritual matter.” Insightful and illuminating, this story follows the exciting journey of a hero which is like Indiana Jones meets the Buddha with a dash of Celestine Prophecy. “Trailing Sky Six Feathers” shines light on the darkest elements of the human condition, including the author’s own. Ian Prattis shares personal journey, advocates about spiritual awakening, empowerment in new book: Trailing Sky Six Feathers: One Man’s Journey with His Muse. Prattis further believes that the culture needs to awaken spiritually if humanity wants to ensure survival. For him, “the world has become an unpredictable beast that people fail to work with intelligently; and humanity has to take back control of themselves for this is a spiritual matter.” Insightful and illuminating, this story follows the exciting journey of a hero which is like Indiana Jones meets the Buddha with a dash of Celestine Prophecy. 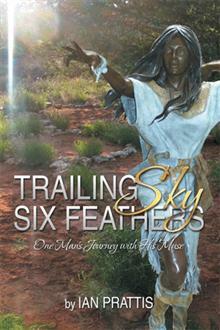 “Trailing Sky Six Feathers” shines light on the darkest elements of the human condition, including the author’s own. Ian Prattis is an author, poet, professor emeritus, founder of Friends for Peace, and spiritual warrior for planetary care, peace and social justice. Prattis is also a Zen teacher since 1997, offering public talks and retreats all over the world. He currently lives in Ottawa, Canada and encourages people to find their true nature so that humanity and the planet may be renewed. He mostly stays locally to help turn the tide in his home city for good things to begin happening spontaneously.